You are going to fall in love with this 3-story townhome with one car garage located in a fabulous secure neighborhood! Proudly offered at $2,100 per month! This home has everything you need, including a light & bright living area, nice kitchen with plenty of cabinet space, an owner’s bedroom with two walk-in closets and en suite bath with dual sink vanity! Two additional spacious bedrooms, full bath, and a finished lower level rec room with half bath complete this home. Oh, and don’t forget, the all important inside laundry area! When it’s just too nice to be inside, enjoy a cup of coffee on your attached deck, relax on your new patio, or garden inside your private, fenced in yard! Or, roam the beautiful grounds of your community which boasts several neighborhood gazebos and great winding trails! Located in wonderful Skyview Park, this neighborhood has it all! Explore the community on one of the trail paths, enjoy a cup of coffee in a covered gazebo, or monkey around on the tot lot! Venture just a stone’s throw away out your door and enjoy the beautiful Woodlawn Park! An extra bonus to this townhomes’ location is that it is within 2 miles of Fort Belvoir, allowing you to easily take advantage of the many activities at this large facility. Commuting is a breeze with access to Route 1, the Fairfax County Parkway, Route 95, and 495 just minute away! Need to complete some errands on your way home? No problem! The Woodlawn Shopping Center has a Food Lion, Wendy’s, Subway, and more! Also close by is the Engleside Plaza providing you with even more options such as a Safeway grocery store and CVS Pharmacy! Contact Ask Gina & Company today and let us unlock the possibilities! 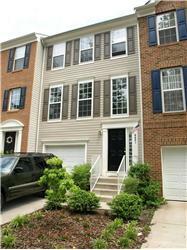 Welcome Home to 8451 Byers Drive, Alexandria!